African governance has improved by 1.0 index point this year and overall GDP by nearly 40%. Despite this, many governments have failed to translate growing wealth into increased opportunity for its citizens. This is according to the 2018 Ibrahim Index of African Governance (IIAG) released on Monday. The Ibrahim Index of African Governance (IIAG) is a tool that measures and monitors governance performance in 54 African countries. In this context, governance is termed as the provision of the political, social and economic public goods and services that every citizen has the right to expect from their state, and that a state has the responsibility to deliver to its citizens. A country's performance in delivering governance is measured across four key components, namely: Safety and Rule of Law, Participation and Human Rights, Sustainable Economic Opportunity and Human Development. The 12th edition of the index spans over 10 years and in that way, is able to provide an informed analysis and trajectory of a country's governance. Despite the numerous challenges raised by leaders in the 2017 Ibrahim Forum "Africa at a Tipping Point" Marakesh Conference, the overall governance trajectory for the continent has been positive. Like the 2017 index, the overall governance for this year has improved by 1.0 index point while safety and the rule of law seems to be experiencing an increased deterioration and a concern to the index. Also noted is the continents economic growth over the last decade which has failed to translate into progress in Sustainable Economic Opportunity. Africa's GDP has grown by 39.7% over the same period; almost half (43.2%) of Africa's citizens live in one of the 25 countries where Sustainable Economic Opportunity has declined in the last ten years. Many African governments have failed to translate economic wealth into Sustainable Economic Opportunity for their citizens. This interacts with the newly added variable which indicates that governance lags behind population growth and youth expectation. Home to one of the youngest populations in the world, Africa is a young continent; with a median age of some 19.3 years and 75% of its population aged 35 or younger. The continent is acknowledging through movements such as Fees must Fall and the Arab spring - that the large youth population presents many complex and important strategic challenges and solutions. The express inclusion of youth socio-economic integration in regional policies for determining effective governance, is a success in this regard. In countries where authoritarian and successive challenges still ensue, youth inclusion as determinants for good governance entrenches the responsibility on leaders to see youth inclusion and developments as investments and not a threat. Since its initial report in 2007, the IIAG adopts a disruptive but humble approach. It strikes a balance between creating a clear picture on the changing African landscape whilst facilitating critical conversations on leadership, sustainable change, socio-political and economic transformation. Human rights and participation has improved over the last 10 years in action but recent findings indicate a steady deterioration in substantial civil liberties. 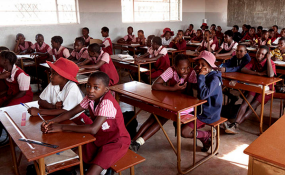 The quality of education and lack of infrastructure remain key concerns in the worst and slowest improving category this year: sustainable economic opportunity. Given just how important these components are for the fourth industrial transition, the index advocates for strengthening the rule of law to encourage economic investment and trade and improved infrastructure. As previous indices have illustrated, the distance between those points is leadership.